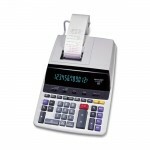 Heavy-duty commercial calculator features a built-in, multi-angle kickstand to customize the angle to your personal preference. Print 4.3 lines per second in two colors with positive numbers in black and negative numbers in red. Design also includes an easy-to-read, extra-large, 12-digit display and two independent four-key memories. 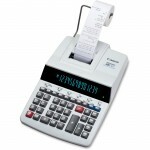 Sales tax rates can be easily stored and accessed. 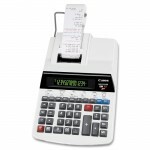 Functions include cost/sell/margin, 5/4 rounding, round up/down/off, item count, grand total, delta percent, auto decimal entry, mark-up/down, percent key, percent add-on/discount and variable decimal (add mode, 0, 2, 3, 4, 6, and floating). 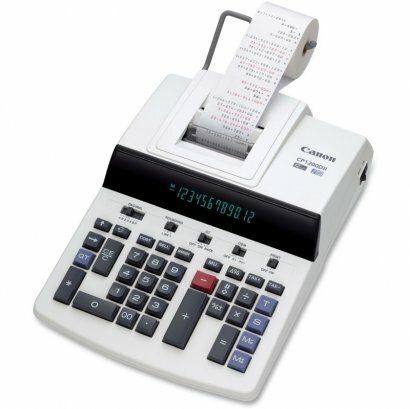 Calculator uses 2-1/4" paper and runs on AC power.